DETAILS: Enjoy dazzling views of both the gulf and Western Lake from the third and fourth floor balconies of this multi-family residence with accommodations for two. The furnishings are a sleek fusion of snowy white and jet black against a buttercream background, creating a calming coastal oasis. The open living area is awash in natural light, and furnished with a sleeper sofa facing a television with DVD and a wall of windows framing the open gulf-facing balcony. A dining table for four offers vistas of Western Lake. There's additional seating for two at the breakfast bar, which opens to a cool white kitchen equipped with stainless appliances. A full bath features a shower and single vanity and a stackable washer and dryer are conveniently located in the hallway. 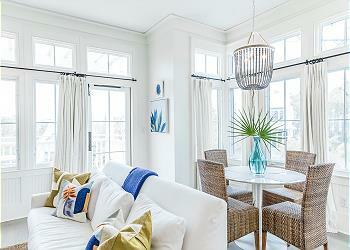 Upstairs, the master boasts fabulous gulf and lake views from a perfectly positioned window seat and wall of windows. Furnishings include a king bed and television. The gulf views continue into the master bath, equipped with glass-enclosed walk-in shower and single vanity. A private balcony is perfect for sunning. The beachside location of this residence offers guests close proximity to the BeachClub and the sugar sand beyond. We had a wonderful spring break at “Heavenly Days.” This property was super quiet and peaceful despite all the people and construction going on around the corner. Decor was perfectly coastal without being cluttered. Very well maintained property.